Celebrate Canada 150 with this delicious vegetarian tourtiere. This recipe was originally published March 30, 2017. If you are offended by this untraditional meatless version, don’t worry our French Canadian Assistant Director Anne-Marie has already voiced her concerns. Add olive oil to a large dutch oven or high sided frying pan on medium high heat. Add mushrooms, cook until browned. Remove from pan with a slotted spoon. Add more olive oil if needed. Add onion, celery, sweet potato, garlic. Sauté until browned and softened, (sweet potatoes will still be a bit firm at this point). Add herbs, tomato paste and spices. Stir for 2-3 minutes. Deglaze with white wine. Add bay leaf, green lentils, vegetable stock and return mushrooms to pan. Simmer for 20-25 minutes or until lentils are tender and most of the liquid has evaporated. Taste and season with salt and pepper as needed. Let cool slightly. Take pie dough out of the freezer while filling cools. Roll out 1 dough just larger than your pie dish then place inside, pressing dough up the edges. Flute if desired. Use a 1 or 2 inch maple leaf cookie cutter to cut out approx 10-20 shapes (depending on the size of your cutter). 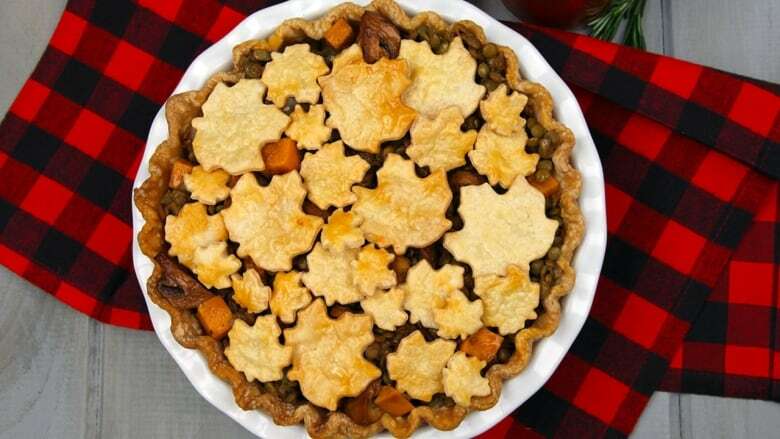 Add filling to pie shell. Place maple leaf cut outs on top in a decorative pattern. Whisk egg and water together, brush egg wash on top. Bake according to pie dough package instructions. Remove pie from oven and let sit at least 10 minutes before slicing. Serve with Tomato Maple Chutney and a fresh green salad or green beans. Add all ingredients to a sauce pan on medium heat. Simmer for 15-20 minutes. If desired carefully break up tomatoes with a potato masher. Serve alongside tourtiere.